If you like our Projects of the Month but have missed some months (or just like things in bigger servings), you can get our latest 6-month project bundle (March 2010 - August 2010) for just $25. This bundle contains 18 projects (12 in 3D design, 6 in geometry), taking up 226 (!) pages. We send it to directly you as a PDF - no license or software locking. Color graphics, print whatever you need, or just view it on-screen. The full list of contents, and ordering info are on my website. Enjoy! And keep in mind you can always get each month's set of three projects for just $5. Sorry, I took a 3-month summer break from the Math Forum, but now I'm back, ready for some great math projects for the 2010-11 school year. Remember, these projects are FREE and aren't just for math teachers! You'll learn how to create one hexagon with all the lines inside it. That hexagon can be tiled to make lots of interesting patterns. As always, this project has a Student Version and a Teacher Version (both in PDF format). Try it out! A math professor named Debra Borkovitz, who has the entire GeomeTricks set of books, created some YouTube videos showing some geometric concepts using SketchUp. This prompted me to write one of the projects that will be included in the September Projects of the Month, going out in a couple of days. In this project, you find the solid that results from the intersection of two or three cylinders. The short video below shows how a section plane can slice through a cube. Note: when the plane gets halfway through, the resulting 2D shape is a hexagon. Section planes have enormous potential in geometric projects, and I plan on writing more about them in the coming months. What's Coming in our September Projects? 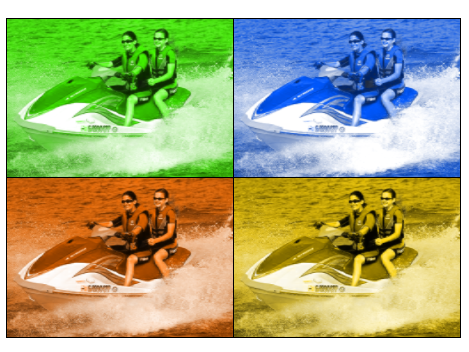 Want a great way to show your best summer vacation photos? Bring out your inner Andy Warhol by using SketchUp to transform a single photo into a multi-color montage. 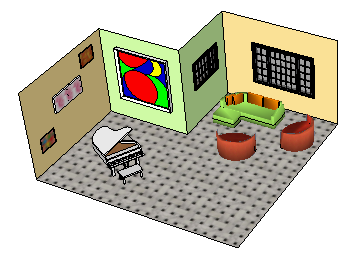 Imagine you have a room, a few pieces of furniture, and some paintings. But you have a few ideas about where everything should go. 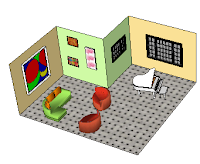 By using SketchUp layers and scenes, you can easily see how all of your design ideas look, and can switch between designs with just a click. 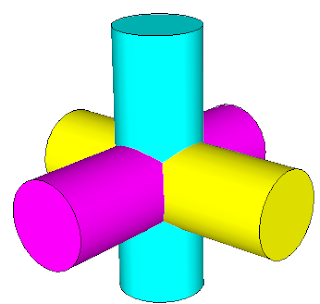 Take two or three perpendicular, intersecting cylinders - can you guess what the intersection solid looks like? 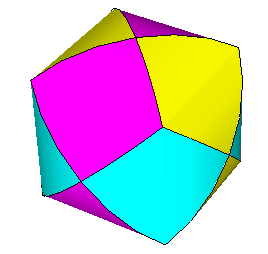 Imagine no more - SketchUp makes it easy to find this shape. At still just $36 for the year (3 projects per month for 12 months), sign up at Projects of the Month. At last week's 3D Basecamp in Boulder, we were treated to the world premier of French architect "Corbusier"'s latest video. Accompanied by the usual red carpet, celebrities, etc. If you're French, please don't be offended. Indeed, zere is no excuse for not using ze LayOut. No more dinosaurs! Paul Lee (above, see the resemblance?) has also put together some training course material in SketchUp / LayOut for construction documents. I'll be posting more on that in the near future. I can't believe I've been neglecting this blog for almost a month - sorry about that! August was a little crazy with a bit of traveling and little child care. But I have a ton of things to write about, including tidbits from last week's SketchUp user conference.